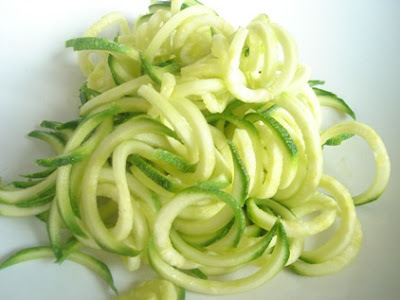 I'm definitely not "going raw" on you here, but the zucchini "noodles" that raw foodies use in place of traditional cooked pasta have always interested me. So tonight when faced with the dilemma (MAJOR crisis!!!) of not-quite-enough spaghetti for the hungry natives, plus a wealth of zucchini and some grape tomatoes, I decided to give this raw "noodle" thing a try... This is NOT a "raw" recipe because I did use cooked pasta as well, but it was definitely a fun experiment with tasty results. I cooked the bit of pasta I had, and while that was cooking, I shredded (or sliced?) 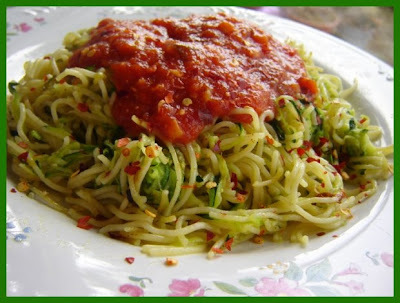 the zuchinni into long, spiraling "noodles". I ended up with a ratio of about 2/3rds raw zucchini and 1/3 cooked pasta. After I drained the cooked pasta, I tossed the zucchini with it and drizzled with a little olive oil. Yes, I suppose the heat from the pasta "cooked" the zucchini somewhat. I topped everything with the following "raw" tomato sauce which I've actually made many times before. The sauce is amazing on hot summer days when you don't want to heat up the kitchen!! I admit my tiny grape tomatoes weren't garden-fresh, but they had a nice flavor anyway. Blend all of the above in a food processor until smooth. Add red pepper flakes and a splash of red-wine vinegar to taste if you like.... Pour over pasta of your choice. Enjoy!! Have a great weekend, enjoy the sunshine (if any shines in your part of the world - lots of "liquid sunshine" here!!). Looks great - it'll definitely come in handy when we're (hopefully!) overloaded with fresh tomatoes from our garden this summer. That sauce sounds delicious! I can't wait to try it once tomatoes show up at the farmers market...hopefully soon?! raw zuke noodles have always interested me too, i keep meaning to give them a try! Wow! This dish has caught my attention and looks so intriguing... I may just have to give it a go when the veggies are ready for harvesting. Looks great, I am trying to up my raw intake so will be making this.